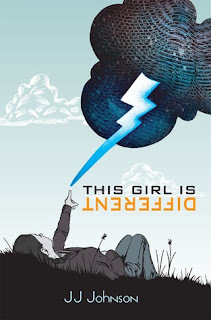 From Goodreads: "Evie is different. Not just her upbringing-though that's certainly been unusual-but also her mindset. She's smart, independent, confident, opinionated, and ready to take on a new challenge: The Institution of School. It doesn't take this home schooled kid long to discover that high school is a whole new world, and not in the way she expected. It's also a social minefield, and Evie finds herself confronting new problems at every turn, failing to follow or even understand the rules, and proposing solutions that aren't welcome or accepted. Not one to sit idly by, Evie sets out to make changes. Big changes. The movement she starts takes off, but before she realizes what's happening, her plan spirals out of control, forcing her to come to terms with a world she is only just beginning to comprehend. JJ Johnson's powerful debut novel will enthrall readers as it challenges assumptions about friendship, rules, boundaries, and power." This novel wasn't anything like I expected it to be. Then again, I'm not sure what I was expecting! J.J. Johnson has created a character that is so far different than your average 1st world teenager! Kudos! Evie is such a great character, I thought that I would find her irritating when I first started reading, but I really didn't. Being home schooled and growing up in a democratic, green (the eco friendly green) environment, she finds it really difficult when she goes to a public school. A public school where the teachers rule and the students drool pretty much! Rajas is the love interest in this book. He doesn't like labels. Especially the label of boyfriend and girlfriend. Which Evie understands, but as the story goes on she can't understand why the label matters so much. I really liked Rajas as a character, except for one of the things he did that hurt Evie. All characters have their downfalls though, that's what gives them depth, right? Rajas and Jacinda are her two best friends at the school, Rajas her not-labelled-boyfriend and Jacinda his cousin. Jacinda, on the outside, is your typical cheerleader stereotype. But as the story builds we come to realise that she breaks this stereotype, which I really liked. It's not very often (in my reading and viewing anyway) that there is a cheerleader who is a lovable and deep character. Evie wants nothing more than to help better the school system by allowing the students to have a say. But she goes about it all wrong. Creating a blog with the help of Jacinda, where students can talk freely about whatever they please. Their first post was a 'lightning strike' against one of the teachers, that called a student fat and needed to eat less to get skinnier. This of course spirals way out of control, friendships and relationships are tested. Not only that, but the school gets thrown into turmoil, all because of this one blog. It's amazing that one blog could hold so much power, but J.J. Johnson wrote the story in a believable way. Had this happened at my school, I can see a some what similar situation arising! I understand where Evie is coming from, I couldn't understand all the rules that my school had. I freaked out that one time I got detention for something absolutely ridiculous, that I can't even remember why I got it. I went to a private school and I do think that a lot of the rules were so random, but others were needed. Especially after reading this book, where total chaos broke out when the system was seriously questioned! I really enjoyed this book, J.J. Johnson has written a great and intriguing story, that more than held my interest the entire way through the book. The ideas throughout the book had me thinking about my school life and my life in general, at how one person can make such a difference. Not only that, but I liked how eco friendly she was (her whole house, eco friendly!). This is the second galley that I have read from NetGalley, and I so far have not been disappointed! If you haven't already, you should jump on that band wagon! This sounds really really interesting :) I love love love NetGalley! It's so incredibly addictive :S Great review! !